There are a lot of slots myths in the gambling world that are created mostly by the gamblers themselves. Like any other gambling, slots have the range of slots myths that are widely spread among the admirers of this kind of gambling. Let us deal with some of them in particular. 1. About to pay machine can be spotted. It is a pure myth, because the winning slots cannot be noticed anyway. Even the machine with the highest payout percentage cannot guarantee the gamer the jackpot. Random number generator usually hands out all the repayments, but not the slots itself. 2. Loose machines are placed in special places. Loose machines are not necessarily are put in some particular place. 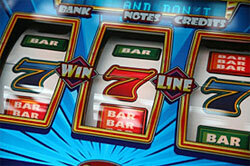 It is true that the slots in general are put in the crowded places with high traffic. However, casino moves all machines all the time around the house. 3. It is possible to define the winning odds counting symbols on reels. It is wise to remember that random number generator makes use of the virtual reels that correspond to the real that always affect the odds. 4. The longer machine does not pay, the sooner it will. Again the RNG regulates the repays. There are no formulas for payment predictions. Indeed, the machine meets the programmed percentage into the RNG, but it is impossible to define, when it is going to happen. 5. Players win more by pulling the arm then by pushing the button. In fact both of the abovementioned playing options are considered to be the signals for the game beginning. As soon as the slot machines reels started spinning, the random number generator has already defined whether the winning or losing spin will be. 6. Hot coin increases the odds. It is obvious for each, who knows the way slots work, realizes that hot coin heated up by the real flame is not going to warm the gears and make them loosen. It is obvious that ultimately positive and creative gambler invented the myth, who drank too much seating at slots. Again the random number generator operates the payouts, though the house may change the stakes for particular gamer types in order to accommodate them for gambling at certain periods of time, for instance.